The third series of parliamentary elections held in Lebanon's Second Republic since its birth in 1989 were in some respects the most dominated by Damascus [See How Syria Orchestrates Lebanon's Elections in the August issue of MEIB]. Syria's role in gerrymandering electoral districts was more blatant in the latest election cycle, and its power to determine the political "rules of the game" (if not the precise candidate lists) remained palpable. Independent candidates with no ties to the Assad regime faced overwhelming obstacles and fared as poorly as ever in this year's elections. Moreover, the campaign season witnessed a dramatic extension of Syrian political patronage as several prominent Christian opposition figures bowed to Damascus in negotiating their reentry into the political establishment. Most importantly, Syria managed to bolster international perceptions of electoral legitimacy in the latest polls. Ferocious (but heavily managed) infighting among pro-Syrian candidates created an illusion of contestability in the elections while a slight increase in public participation (buoyed by rampant vote-buying) gave the process an aura of public acceptance. Perhaps the greatest challenge facing Syrian President Bashar Assad is the necessity of preserving his regime's political and economic control over Lebanon while coopting opposition to Syrian authority within the country and deflating criticism of the occupation in the international community. In this respect, his handling of the parliamentary elections may well be remembered as a political master stroke. But by changing the constants in Lebanon's political equation, Assad may have unwittingly unleashed socio-political forces beyond his control. In previous elections, Syria micromanaged the electoral results by pressuring its Lebanese allies to set aside their ideological, sectarian, and parochial differences and form "steamroller slates" which easily defeated coalitions of independent political candidates. This time around, however, Damascus permitted the polarization of many pro-Syrian politicians into two opposing camps, one aligned with the current Lebanese regime and the other centered around former prime minister Rafiq Hariri. Several implications of this strategy merit examination. First, it should be noted that this polarization did not entail a weakening of pro-Syrian allegiances among Lebanon's political elites. Candidates on both sides of Lebanon's government-"opposition" divide made repeated pilgrimages to Damascus to meet with Assad and consulted regularly with Gen. Ghazi Kanaan, the head of Syrian military intelligence in Lebanon, throughout the electoral campaign. This spectacle led British journalist Robert Fisk to report from Beirut that "despite the 589 pro and anti-government candidates standing for the 128 seats in Lebanon's national assembly, every one of them is pro-Syrian. "1 In this respect, the elections were quite similar to those have taken place in other satellite states. In the communist states of Eastern Europe during the cold war, only pro-Soviet candidates were allowed to run for election, yet campaigns were often quite vigorous (as is often the case when political elites are thoroughly discredited in the eyes of the population). Technically speaking, of course, Hariri was an "opposition" candidate insofar as he campaigned against the policies of the current regime. But to characterize the victory of Hariri and his allies over those of the incumbent prime minister with the headline "Syria's Man Loses by a Landslide" (as the New York Times did on September 5) is a scandalously poor reading of the elections. 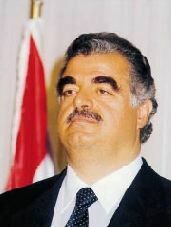 Hariri, after all, was appointed prime minister by the Syrians in 1992 and proved himself to be a loyal servant of Damascus during his six years in power. In fact, his ties to Syria long preceded this appointment (it was Hariri's construction company that built the presidential palace in Damascus). A close examination of Hariri's electoral coalition is very revealing. New faces in the victorious lineup include Bassem Yamout, a personal friend of Bashar Assad during the latter's medical studies in London, and Nasser Qandil, a close friend of the deputy chief of Syrian military intelligence, Maj. Gen. Assef Shawkat, and his wife Bushra Assad (Bashar's older sister). Another "opposition" candidate aligned with Hariri was Transportation Minister Najib Miqati, a major business associate of the Syrian president. Hariri's alliance with such figures was no accident--the best way to win an election in Lebanon is to pile onto one's electoral bandwagon as many associates of the current Syrian regime as possible. And, of course, the fact that Hariri is a partner in an Arab consortium which invested $100 million in Syria prior to the elections didn't hurt his chances either. Interestingly, candidates such as Elie Hobeiqa, Jean Ghanem and Muhammad Youssef Baydoun, who remained loyal to members of the "old guard" in Damascus (e.g. former army chief of staff Hikmat Shihabi and Vice-President Abdul-Halim Khaddam) lost miserably in the elections. Hariri, on the other hand, distanced himself from such figures, marketing himself exclusively to the young Syrian president. Second, in many districts, Syrian-sponsored "steamroller slates" characteristic of previous elections still remained the order of the day. In the South Lebanon/Nabatieh district, pro-Syrian candidates from across the political spectrum were herded onto a single 23-member electoral list. The ability of Damascus to pressure its allies into electoral coalitions that would never materialize on their own is remarkable when one considers the makeup of this list. Two of its members, MP's Bahiya Hariri and Mustafa Saad refused to even shake hands during a recent public appearance. In the Western Beqaa, the only slate on the ballot was the "Decision List," an alliance of all six of the district's incumbents that was formed six months prior to the elections after lengthy consultations with Syrian officials. Third, this split between the Lahoud regime and the Hariri/Jumblatt coalition did not enhance the electoral prospects of independent candidates. Popular leftist MP Najah Wakim, who had successfully won office in the 1992 and 1996 elections, withdrew his candidacy last month, claiming that the electoral results were being manufactured in advance. "The results, down to the numbers of votes each candidate will have, are already known. I, for example, know how many votes are allotted to me," said Wakim, speaking before a crowd of his supporters. Other candidates who remained outside of Syria's orbit faced enormous obstacles in the electoral process. Najib Zouein, a candidate in the Jbeil-Kesrouan district who has called for the withdrawal of Syrian forces, was subjected to a continuous stream of escalating harassment. His campaign posters were repeatedly torn down in the weeks preceding the election and on August 21 his car was vandalized, with an attached message warning him to withdraw from the election. "This only makes me more obstinate to go ahead with the campaign," Zouein said afterwards. "I will not withdraw my candidacy --I will see this through to the end. "3 Zouein was not elected. Former parliament speaker Kamel al-As'ad, a prominent Shi'ite leader in Lebanon's First Republic and opponent of Syria during the civil war, encountered similar problems in his campaign against the Syrian-sponsored list in the district of South Lebanon/Nabatieh. When unidentified gunmen opened fire on his residence in Kfar Tibnit last month, Lebanese soldiers arrived at the scene and arrested nine of As'ad's guards who had returned fire at the gunmen and conducted an illegal search of the premises. "They even went into the bedrooms of Mr. As'ad's children and [his] office and tampered with the furniture," said a source close to As'ad after the incident.4 He too was not elected. Metn MP Nassib Lahoud, one of the only sitting MP's who has called for a reassessment of Syrian-Lebanese relations (though not explicitly for a withdrawal of Syrian troops) was banned from displaying campaign posters. Representatives of a company he hired to provide billboard advertisements for his campaign pulled out of the deal, saying that they had come "under pressure" and would not risk "destroying the business." Municipal workers tore down the displays and replaced them with those of candidates of the Syrian-backed list headed by Interior Minister Michel Murr. Lahoud said that when he filed a complaint with Prime Minister Selim al-Hoss about the incident, Hoss "asked interior ministry agencies to investigate the matter--the same agencies I accused of committing the excesses. "5 Surprisingly, Lahoud still managed to win a seat in parliament. Security forces were illegally present inside many polling stations (designed to intimidate supporters of independent candidates). Many polling stations lacked curtains for the voting booths (exposing voters to observation by the above-mentioned security forces). "Posters of running government officials were plastered on the doors and inside polling centers." The illegal use of government vehicles to transport voters to the polls was widespread. State-backed candidates were permitted to obtain voter registration cards for their supporters after the August 21 deadline had passed. Ostensibly this was to replace lost cards, but "many of these replacement cards were issued to people who didn't even have a voter registration card in the first place" said LADE. Another important dimension to the elections was the successful effort by Damascus to induce the participation of many traditional Christian politicians who had boycotted the polls in 1992 and 1996. Another prize for the Syrians was former MP Albert Moukheiber, a well-respected Greek Orthodox Christian who had long been a staunch critic of the Syrian presence. 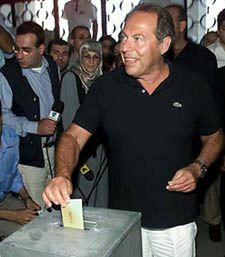 Although it's not clear if Moukheiber explicitly agreed to limit his criticism of the occupation, he was persuaded not to join Nasib Lahoud's opposition slate in Metn (as he did in the 1996 elections). Other Christian traditional Christian politicians who were elected include Kata'ib candidates Antoine Ghanem and Nader Sukkar and two candidates aligned with the late Raymond Edde's National Bloc, Salah Honein and Abdallah Farhat. The Syrian regime believes that the return of such prominent figures to Lebanese political life will diffuse growing disaffection among Christians. It has also promoted a nascent political alliance between Druze leader Walid Jumblatt and traditional Maronite political elites. Ironically, Jumblatt successfully appealed to Christian voters in the Shouf region by making a number of statements critical of the Syrian occupation (a strategy mimicked by several other pro-Syrian politicians in the elections). In the end, the Syrian regime managed to square a very difficult circle: ensuring the election of pro-Syrian elites while cultivating the illusion of a free and fair electoral process. In fact, Damascus made it look easy, demonstrating that one does not need a truly democratic process to induce the U.S. State Department to endorse the electoral results and earn rave reviews from the American press. The trick is to exploit the paramount myth underlying American government and media perceptions of Lebanon--that the country is "hopelessly fractured" along sectarian lines. By enticing prominent Christian leaders to participate and encouraging some of its own allies to speak of "reevaluating" the Syrian-Lebanese relationship, Damascus has rendered its control of Lebanon much more acceptable and legitimate in Western eyes than ever before. 1 The Independent (London), 27 August 2000. 2 The Daily Star (Beirut) 2 September 2000. 3 The Daily Star (Beirut) 22 August 2000. 4 The Daily Star (Beirut) 19 August 2000. 5 Al-Wasat, 14-20 August 2000. 6 Press Release, Committee for Good Governance in Lebanon, 10 August 2000. 7 L'Orient-Le Jour (Beirut), 17 August 2000, The Daily Star (Beirut) 16 August 2000. 8 See Gemayel Returns to Lebanon, Middle East Intelligence Bulletin, August 2000.